With Season 2 now in the rearview mirror it is time to look ahead to Patch 2.2, Season 3, and what is in store for the Wizard master race. The new Season is just a few days away. Lots and lots are changing with the patch. Even more will change with the start of the season and the new seasonal legendaries coming in to the mix. Wizard Changes Preview for Patch 2.2! 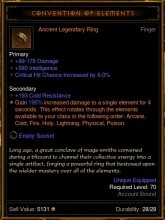 These changes have made Tal Rasha’s a very viable high end Greater rift and T6 build. Coupled with the redesigned Bastion’s Will (The Focus and Restraint ring set) or the new Convention of Elements (example right), it has become a very fun, rotational Wizard build that is capable of crazy damage numbers. 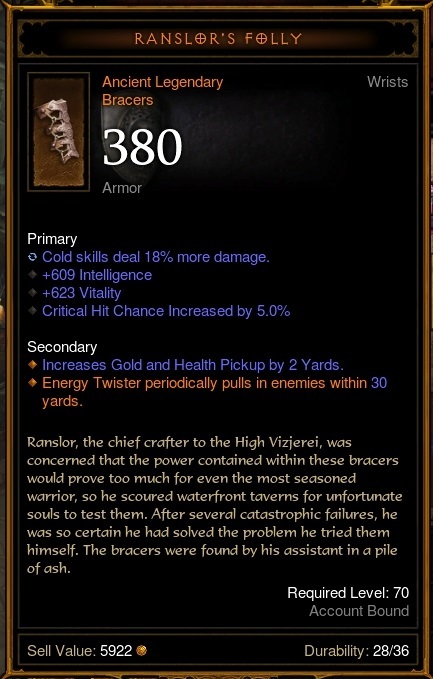 The popular build on the PTR uses the new Tal’s set, Bastion’s Will, and the new meteor boots, Nilfur’s Boast (example below). This combination can make your Meteor – Star Pact or Meteor – Molten Impact hit like a truck. It’s definitely a lot of fun to play around with and capable of pushing really high into Greater rifts. I’ve seen Star Pact specifically crit for over a billion. There is also the possibility of combining the sets and just utilizing some of the affixes. I highly recommend playing with this at the beginning of the new season. I spent the most time using the 2 piece Tal’s set bonus with full Deslere’s Magnum Opus. The proc meteor’s off of Tal’s are a huge dps increase, and passive damage is alway’s a plus. Pair that with the bonuses from Delsere’s and you have a really interesting build. Without nearly optimized gear and a non-ancient Gesture of Orpheus I was able to clear grift 40 with ease. It’s also a nice visualization and a good change of pace from Firebird’s. 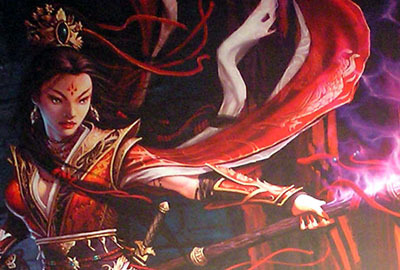 This now makes the Firebird’s cheat death attainable with other sets and builds, including Tal’s and DMO. That’s a huge plus for Greater rifts, because as Wizard’s already know, Unstable Anomaly usually needs a backup. Firebird’s has filled that role for the last two seasons and it is good that we can still obtain it while using the new sets. Options are never a bad thing, as long as they are good options. Ranslor’s Folly and Crown of the Primus both seem to have cleared the PTR test phase and will make it to live as previously discussed. 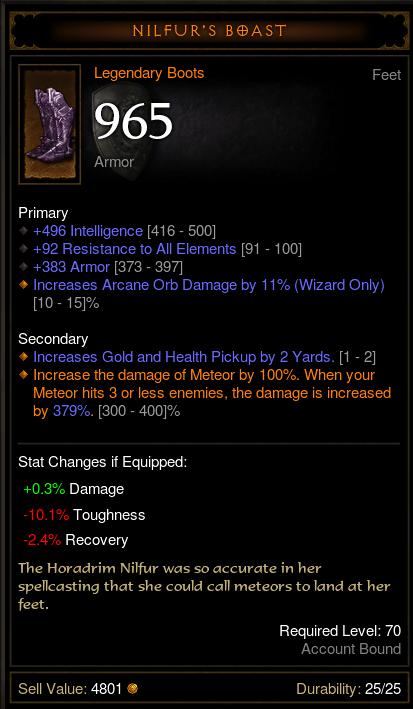 Both of these items mesh well with Delsere’s Magnum Opus and got heavy use from me on the PTR. The bracers turn Energy Twister into a black hole-like spell capable of controlling an entire screen. Keep in mind that Energy Twister is spammable, folks. The helmet is also seeing good use in group play. Unlocking all of the runes of slow time effectively gives the party 15% more damage, reduces enemy damage by 25%, stuns everything entering and leaving the bubble, and slows projectiles and mobs. With DMO, and some CDR gear, Slow Time is always available for casting. This leads to a very safe battlefield for you and your cohorts. It’s really to see a support Wizard build be possible in the new season. We have been lacking group synergy for a long time. Maybe this will steer that in the right direction. Though not a Wizard specific item, the newly affixed Obsidian Ring of the Zodiac is also drool worthy with either of the newly designed sets. It is a front runner for BIS in some builds already. Once the early weeks of Season 3 flesh out, I think some really interesting item combinations will come into play. Items weren’t the only presents coming in the new patch. It’s also important to mention some quality of life changes they made as they do affect our game and efficiency. Gems and crafing materials now pick up all at the same time when you pick one up, gem upgrading now happens instantly instead of showing a progress bar, and regular potions have been removed from the game! Now you just have a potion button that is inevitably replaced after finding your first Legendary Potion. No more dodging annoying and useless potion stacks. The road ahead is paved with lots of improvements as well as new loot and combinations for us, the master race, to play with. I’m excited to get into a live season and let these different items change my build and gameplay as I progress. I’m excited to see where I start, and eventually, where I end up. What are you looking forward to that’s coming in to Season 3? I don’t know how things will play out, or what build I want to play. I just know, for the first time since ROS shipped, it will not be Firebird’s… at least not at first. not having played on the PTR, these are great news! looking forward to the new changes … and looking forward to the new nagelring as well. I’ll be doing a monk on hc, i really liked the new improved set with dashing strike on the ptr. Great post, thanks for the update. With TR6 extended from 3 sec to 6, I'll definitely be trying the set. 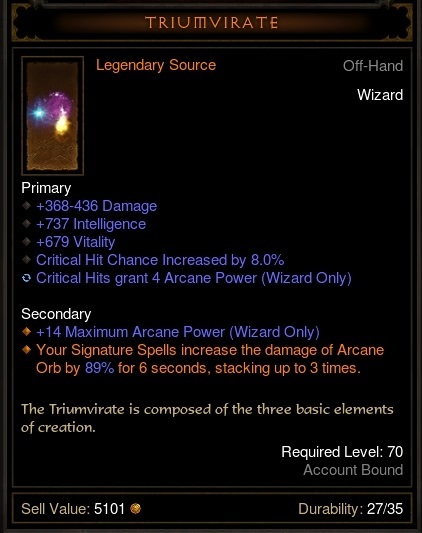 I'll be rolling my first wizard ever for season 3. This post gives me all of the excite! Definitely going Wizard for S3. Apart from quickly leveling to 70, I haven't played Wizard at all since RoS launched, so it's time. Also, a very popular combination on the PTR that you should mention is using RoRG to combine 4 pc DMO (e.g. Legs, Shoulders, Gloves) with 6 pc Tal’s (e.g. Ammy, Belt, Offhand, Helm, Chest) and Nilfur’s Boast. So now you have double-triple damage meteors, and a fast cooldown resetting Slow Time that does 14000% weapon damage per second (that you can continue to do damage while is up). Was very effective. See, I hadn't even heard about that yet. That's what has me so excited. That just sounds super fun. I'm so ready for the season to start. This might be the most anxious I've been to roll my thousandth or so wizard haha. And yes, I didn't think of that when posting that picture, I'll edit it with an update shot soon, thanks! i thought wizards are already crazy op no ? Crazy OP, as in inferior to Hunters in almost every situation? B/c they've been lagging behind Hunters badly in the last two patches, and the PTR didn't seem to help them as much they needed. Don't be surprised by a 5-8 level difference between Hunters and Wizards in most top Grifts boards. There are things we do well, and things we do poorly. But there are those that compare the wizard to what other classes can do at the high level, and we fall short in most all categories. Significantly in coop play. 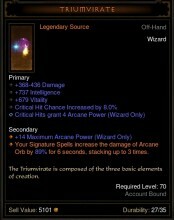 The wizard has zero place in high level greater rifts. Don't get me wrong, its a hell of a lot of fun and if you know what you're doing you can help a group and in a lot of cases carry them. But you will never be able to touch what a monk, dh, barb, or sader can do, or replace a witch doctor in a 4 man grift party. This patch looks to shake that up though. Lot's more options. Firebird is a crazy fun build. I enjoy the hell out of it honestly. But its a solo build. Terrible for running with groups both in a visual and strategic way. The new items are going to give us some truly unique and useful tools that we can bring to group play. In 2.1.2 I wouldn’t quite call us OP for single player. We are definitely above average for trash clearing, but the rift guardians bring us back down to average at best. ‘OP’ is reserved for Demon Hunters exclusively right now, for groups you can add Crusader and Demon Hunter, and for super fast mid GR / T6 clears you can add Monk and Barbarian. All to change and resettle in 2.2. We won’t know how the meta will shape up until 2-3 weeks in I believe. I just hope people spend the first few weeks experimenting with builds rather than complaining. I will make a HC wizard. Still do not know how fragile is this class. DH with almost endless vault and truly ranged attacks feels really safe but I remember it is not the case of the early wizard with teleport which has a long cool down (and often fails) and diamond skin which is really limited in the amount of damage taken together with mid range skills. And I dread the RoRG farming. Up to 35 act I bounty clear on T2 without it on my HC DH. I will make a HC Wizard too. So very interesting, thanks for the update. I played Wizard exclusively at launch and all the way through vanilla, dabbled with monk and barb through RoS.. Then went full retard on Demonhunter for seasons 1 & 2. So very very happy that wizard is more viable again. 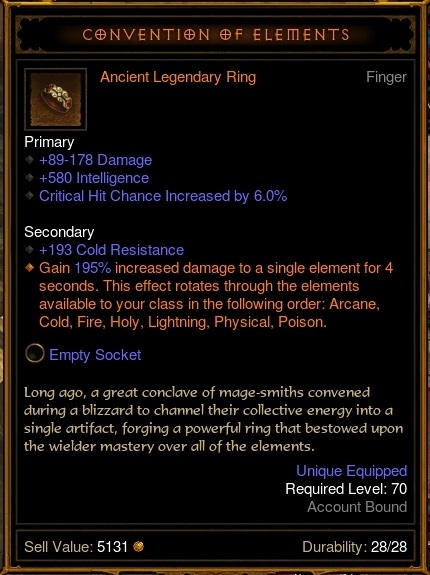 Definitely rolling up a s3 hc wizzy as soon as the season unlocks.